For nearly a decade the world’s largest board game meet up group, London on Board, has been spending two weekends a year by the seaside. 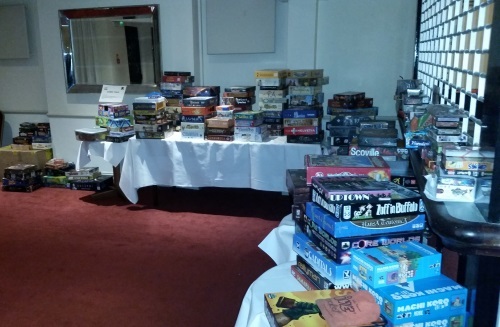 Each spring and autumn a growing number (almost 100 this time) of gamers head down to the York House Best Western Hotel on Eastbourne’s seafront for a mix of games, food, ice cream and alcohol – with quantities varying depending on the individual. I tend to skip the food and ice cream as much as possible to save money for booze, but do take plenty of gaming breaks (Match of the Day, for example, is a must). I’ll keep this brief, but did want to give the Best Western a plug. The first time I went five years ago it seemed a little old and tired, but all those board gamer pounds have been spent wisely and the rooms are now really nice. 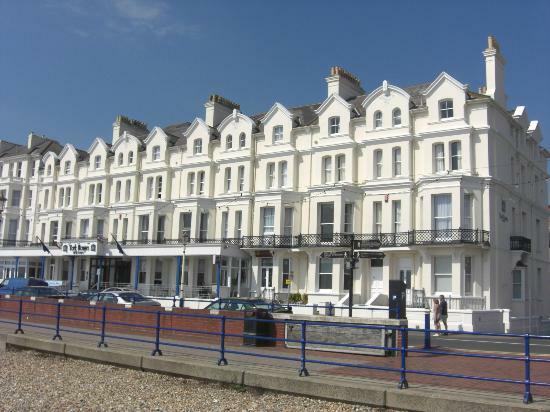 It’s right on the seafront, has a comfortable bar area and a pretty good breakfast too – there’s even a little pool. We take over two large conference areas and pretty much need to be served all day, every day (and most of the night) while we’re there. The staff are always polite and pleasant, even when run into the ground, and beyond a few human error mistakes (which we all make) I’ve never had a bad word to say about them. The best I can say is that I genuinely hope we never change venue. A late arrival, but some great plays convinced me it had been worth it. Despite having a massive ‘want to play’ list I kicked off with a game of Abyss; a game I had no interest in after reading so-so reports since its release. It actually turned out to be pretty good, but the gorgeous art and general over production do not turn what would be fairly priced as a £10 card game into a £30 big box game. Pretty fun, but a terrible rip-off. As the beer started to flow I sat down with Soren, Tom and Karl for what became a back-to back session of Entdecker, two plays of Artus (first basic and then advanced) and a (post Karl) game of ebbes. Entdecker has been on my ‘want to play’ list forever, while the other two I own but don’t play enough. 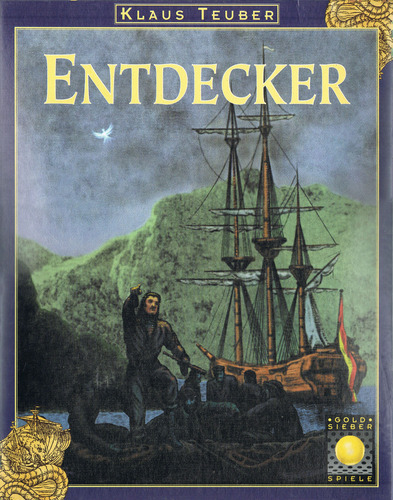 Entdecker was fantastic. It was doing tile placement four years before the classic Carcassonne and while I can see why it didn’t make a similar sized splash, on this play I enjoyed it more. Like Carcassonne it is light and plays in less than hour, but adds more player interaction – and laughs – because of it. Now a must-buy. Artus is madness – especially with four. The game looks pretty innocuous, but it only takes a couple of rounds to realise how dastardly it is and you really have to be ready to be screwed over. The basic version is fast and light, but you have no control: the game involves playing a card to move a piece around the edge of a circular board, scoring points for the space you moved the piece from. Your choices are limited as the game goes on, making for some tough decisions. The advanced version was longer but even nastier, adding some cards which could lose you huge points – but giving you more control, as you place two cards on your turn allowing you to set yourself up for the second card. Getting rid of those nasty cards as early as possible seemed key, as Karl learnt the hard way – losing half his points and going from first to last place in the final turn in the day’s gaming highlight! Ebbes is an interesting little trick-taker but it was very late and it kind of fizzled out as we did, but it was a nice wind-down at the end of a really fun evening. What better way to start a gaming day than with a great big space sandbox game? And they don’t come much bigger that Xia. They also don’t come much stupider than Xia, but it’s a good kind of stupid – the kind of stupid that wears its stupid on is sleeve, loud and proud. The kind of stupid that walks up to you and says ‘Hi, I’m stupid”. The kind of stupid in which rolling 20 on a 20-sided-dice at any point in the game, for any reason, gets you a victory point. Yeah, its that stupid. But importantly its stupid right off the bat and never lets up. It has the kind of rules where you think, ‘What would I make up if I was 12?’ and that’s what’s in the rulebook. Run out of energy to shoot? Ram them. Need to take a short cut? Roll to see if you blow up in the asteroid belt. Blow up in the asteroid belt? No problem – start from a random respawn point. Roll 20? Have a victory point. Flip a random tile? Have a victory point. Kill your defenceless neighbour? Have a victory point. Dumb, but a lot of fun. Next I sat down with John B for a game of Baseball Highlights 2045 – a nice little future sport sim based on a light deck-building mechanism. It’s a little clunky in places and you need to take a few leaps of faith in terms of fitting the theme, but I had a good time playing it and its a must buy for sci-fi loving, deck-building baseball fans (just you then John!). Rich joined us for a game of Viticulture – my third ‘new to me’ game in a row. I did enjoy playing this rather innocuous wine themed worker placement game, but was struck by two thoughts: one, what does it bring to the party? And two, why did I win when I didn’t really play better than the other two? The answer to the second question is the incredibly swingy random cards. The answer to the first question is very little. Pleasant enough though. After this Karl and I left to meet our better halves and head out for dinner. This turned into three courses with plenty of chat/booze and by the time we got back to the hotel we just crashed out for the night, fat and happy. This was a pretty odd day all round, starting with an unlikely random pick up game that tuned into my game of the day. 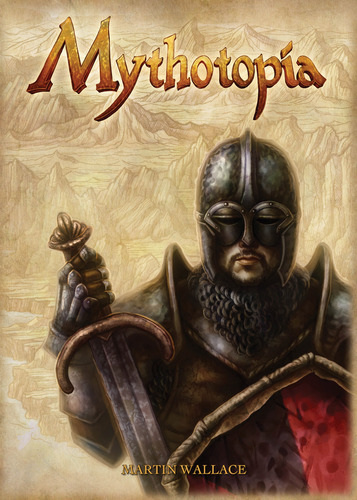 Vika, simon H, Pouria and me found ourselves standing together in front of the games mountain and for whatever reason Mythotopia ended up on our table. I’d played half a game at Essen and quite enjoyed it, so was more than happy to give it a go. It’s a clever mix of deck building with an area control war game, taking some other ideas from Martin Wallace games such as not being able to do certain things unless you’re in a winning position at the start of your turn. This works well and, coupled with moulding your strategy with cards you pick up – plus some random victory point conditions in each game – makes for a very good game. I definitely want to play again. Next Paul A was good enough to teach me my first, and possibly last, Phil Eklund game. The theme of Greenland sounded fun and several friends are really keen on his games, so what could go wrong? A part from terrible graphic design, unbalanced cards, massively swingy luck and players being out of the game by half way. I’m sorry, but this is the worst kind of Ameritrash and no amount of ‘historical simulation’ makes up for a poor design. We then had games of Royal Palace, Welcome to the Dungeon and Der Dreizehnte Holzwuurm (The 13th Woodworm) – the latter of which is a clever little card game I’ll definitely pick up if I see on sale. Welcome to the Dungeon is vastly improved by the new edition having lots more tiles, but it still got old pretty fast. Royal Palace was fine, but I’m now sure that’s all it’s ever going to be and its on the trade pile. Ann was also good enough to take some time out to play the prototype I’d brought along with me, helping change a few of the new cards and get me thinking of some new directions for them. But by 10pm I was all gamed out, heading back to our room for Match of the Day and something of an early night. The day started with two plays of Africana with John B – a game he’d taught me a year earlier that I’d not managed to get out of my mind since. I wanted to see if Zoe liked it and after one play it got the seal of approval and authorisation to add it to the collection. In fact it was the only game we played together all weekend! Job done. With Zoe heading home I jumped in on a game of six-player Pillars of the Earth with Sean, Natalie, Ronan, Tom and Paul F-O. I’d played once before, four years ago and sans expansion, but soon got back into the swing of it. Beer started flowing and with it came the swearing; somehow I managed to grab everything Paul (sitting to my left) wanted, but it didn’t help me win (but did wind Paul up, so it was worth it). Sean seemed to win by going in the ‘2VP’ spot every round, but I’m sure he’d tell you different… Another really fun game in great company. With Sean and Natalie heading home the drinking continued into Elysium (with the addition of Lloyd); a game I played ages ago as a prototype that looks staggeringly good now. It played well and I’m keen to explore it further, but I’m not sure it was the best choice for the moment – which was proved by us having at least as much fun gossiping like girls and drinking more beer in the chip shop. Gee arrived too late to join us, but was eating just in time for us to watch him being attacked by seagulls on the beach while trying to talk to us – definitely the funniest no-gaming moment of my weekend. Paul A then taught me another game: this time Dual of Ages 2. It was every bit as stupid and swingy as Greenland and was almost as stupid as Xia, but not quite. We only played a little skirmish battle (its a card-based hex battle game) rather than a full scenario, but I saw enough to make me want to play it again properly another time. What’s not to like about a fight where Spartacus, a unicorn and a non-IP infringing Crocodile Dundee took on a hick, a WW2 soldier and some weird little space aliens – and lost? Paul A then gave me some useful feedback on my prototype (working title: War!Drobe) before Paul F-O and Ronan stepped in to put it through its paces. I can only guess this started at around 10pm, but I know that it was past 2am when we finally finished talking about it – a massive thanks to them both for a valuable evening. Luckily I wrote plenty of notes and also got to play Ronan’s own prototype, which certainly had plenty of potential. Sunday night ended with drunken promises of more cards, more games and more testing. Monday morning started with rough guts, the realisation five ‘full Englishes’ in a row is probably a little calorific, and thoughts of a four to five hour trip home – especially as it was Zoe’s birthday and she’d be home by five. Decision made, I headed for the train. As always I got home feeling I needed a holiday to get over the weekend, but with some great memories – both gaming and non-gaming related. As I don’t get to London on Board often now, due to rarely needing to be in London, a good half the fun is catching up with old friends; whether that’s over a game, a coffee or a few pints. I expect some people play 20+ games a day while here – I played 24 in total, but didn’t care one bit. And finally a big ‘thank you’ to organisers Paul, Ronan and Tom (alphabetical chaps, no favourites! ); who kept almost entirely below boiling point all weekend (although one particular chat in a chip shop was hilarious) – and to anyone who played with me. Apology: I didn’t record my games accurately and haven’t included the names of everyone I played with – forgive me if I missed you!